A document has been uploaded online to back up evidence that the Nigerian military was aware that of the terrorist group, Boko Haram to kidnap Dapchi Girls. The document shows that Defense Headquarters (DHQ) was told by the Defense Intelligence Agency (DIA) of plans by Boko Haram activists to complete the recent attack in Yobe February. 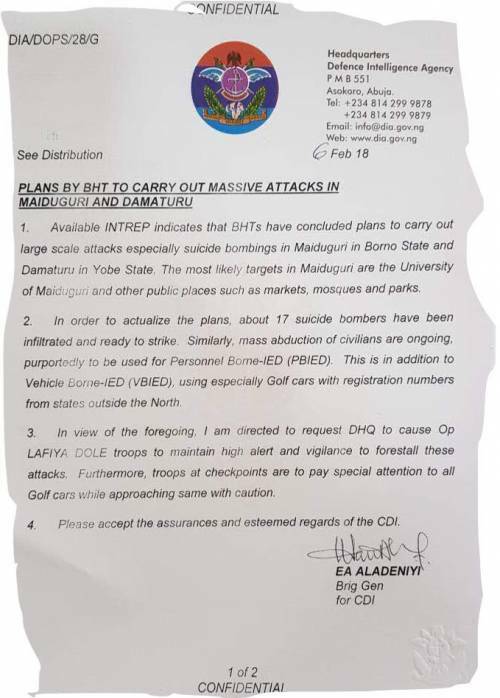 The confidential memo dated February 6, 2018, and titled “Plans By BHT To Carry Out Massive Attacks In Maiduguri And Damaturu.” The document was signed by Brigadier-General EA Adeniyi, he stated that intelligence gathered by the agency indicated that the most likely targets of large-scale Boko Haram attack will be the University of Maiduguri, mosques, markets, and parks in Borno. To carry out the attacks, the document further revealed that Boko Haram had hired about 17 suicide bombers, who were ready to strike as well as carry out abductions. New evidence showing that the Nigerian military was informed that Boko Haram was planning mass abductions in Yobe State has emerged.